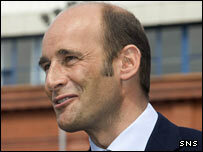 Rangers chief executive Martin Bain has been elected to the Scottish Premier League's board of directors. Bain joins Campbell Christie, Rod Petrie and Eddie Thompson, who are the respective chairmen of Falkirk, Hibernian and Dundee United. After first joining the Ibrox club in 1996, Bain became chief executive in 2005 having previously held commercial and director posts. Lex Gold was re-appointed as chairman of the SPL board by a unanimous vote.